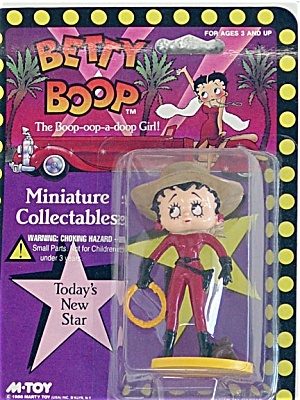 This discontinued 3.75 inch Betty Boop polyvinyl Today's New Star Cowgirl figurine was introduced in 1986 by Marty Toy, or M-Toy, and marketed until the early 1990s when Marty Toy lost the license. A shapely Betty Boop figure is wearing a red cowgirl bodysuit with black trim and black boots, gloves, beige 10-gallon hat, and saddle at her feet. She is holding a yellow rope. This Betty Boop figurine sets on a molded yellow base. Figurine is in new and mint-in-the-package condition.